Llangollen Wharf is one of the longest-established visitor attractions in the North Wales market town of Llangollen, with visitors enjoying trips for over 100 years. From the Wharf you can embark on either a horse drawn boat trip along the feeder for the main canal, or a motorised aqueduct boat trip that takes you across the famous Pontcysyllte Aqueduct built by Thomas Telford. Both of these boat trips take in the magical sights and sounds of this beautiful World Heritage Site. Group rates apply on all trips for larger groups, whilst lunches and cream teas can be pre-ordered for the aqueduct trips. Mulled Wine Special trips operate on the motor boat over the Pontcysyllte Aqueduct at weekends in November and December. We also have two purpose-built 32' self-steer day hire boats for groups of up to 10 people. 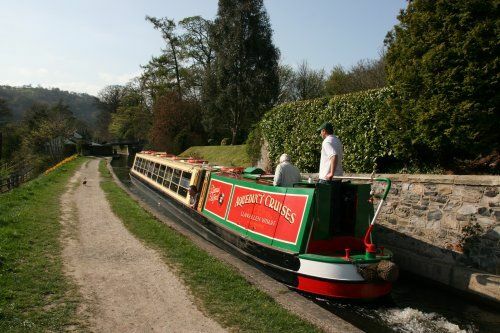 This is an ideal way to take a leisurely cruise along the Llangollen Canal and across the unforgettable Pontcysyllte Aqueduct. Perfect for families, groups of friends and corporate teams alike, a private boat for the day is a totally unique experience. Do you allow dogs on your trips? We allow dogs on our horse drawn boat trips and on our self-drive day hire boats but not on the motorised aqueduct cruise. Do you have parking at the Wharf? We only have a pick up and drop off point at the Wharf but it is only a 5 minute walk from any of the car parks in Llangollen town. What times are the Aqueduct Cruises? We run 2 trips per day. The first departs Llangollen Wharf at 12.15pm and takes 2 hours to cross the Aqueduct where a coach is waiting to bring the passengers back to Llangollen town centre. For the second trip you need to check in at Llangollen Wharf by 1.45pm where you will be directed to the coach pick up point which will take you to the boat for your cruise back into Llangollen Wharf. Why is there no availability for a self-drive boat on your booking site? When you book a self-drive boat on our website enter 1 when asked how many are in your party. The booking is per boat not per person. The maximum allowed on the boat is 10 people and this includes babies. Please note you will need a £70 cash damage deposit on the day of hire. Do you have toilets on the boat? The motor boat which does the Aqueduct Trips does have a toilet. The Horse Drawn trips boats do not have toilet facilities. There are toilets with disabled access at the Wharf. The Day Hire Boats have a toilet. There is disabled access to the Tea Room and toilets at the Wharf. We can load wheelchairs onto the Horse Boats but you should note that we cannot off load them at the Chain Bridge on the 2 hour Horse Drawn Boat trip. We are not able to take Wheelchairs on the Aqueduct Trip although people with some mobility may be able to board and we can carry folded wheelchairs. There is a bus transfer so the usual criteria we use it that if the individual can get on a bus then they will be able to get on the boat. If unsure please contact us to discuss. Can we get food on the boats? There are no catering facilities on the Horse Boats. Take Away food and drinks are available from the Tea Room. The motor boat has a licenced bar and tea, coffee, soft drinks and light refreshments are available on board. We can provide lunches on the 12.15 trip which need to be pre-ordered on the day. Please order at least half an hour before your trip to allow us to prepare the food in the Tea Room. We can also provide Welsh Cream Teas on the afternoon trip. Ordering in advance is recommended. absolute freshness. We serve breakfast and a variety of light lunches throughout the day, plus Welsh Cream Teas are always available with our own homemade scones and bara brith, complemented by jam and clotted cream. Our homemade cakes are our speciality, which are all baked and iced daily in our kitchen. A selection of herb and fruit teas are available in addition to hot chocolate and freshly ground coffee. mid-March, and daily during the rest of the year.